Save up to 55% + get $200 in resort coupons. Book a flight + hotel vacation package of three nights or more to Zoëtry Wellness & Spa Resorts, and save up to 55%* plus get $200 in resort coupons to enjoy during your stay**. Restrictions and exclusions may apply. Three-night minimum stay required. The hotel is located in a protected national park with the world’s second largest coral reef just offshore. PADI Dive Resort certified by the Professional Association of Diving Instructors, plus fishing charters departing from the resort’s own dock. Complimentary catamaran sail with sparkling wine. New Impression™ Club with villa-style accommodations. 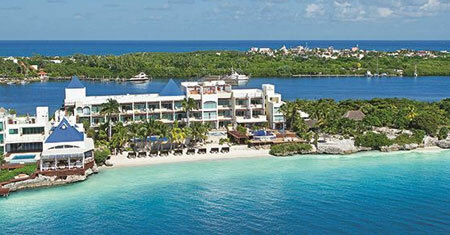 Situated on a private white sandy cove on the beautiful island of Isla Mujeres. Boutique-style resort with an intimate ambiance, offering personalized services. Close proximity to Isla Mujeres Underwater Museum (MUSA) with over 400 sculptures that provide areas for coral growth which may be viewed by diving or snorkeling. 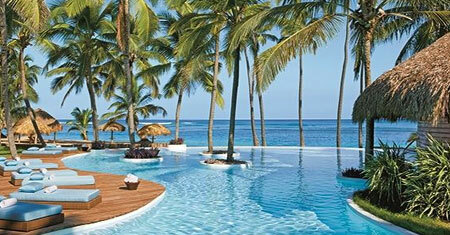 Located on a 200-yard stretch of private beach on the Dominican Republic’s east coast in Uvero Alto. 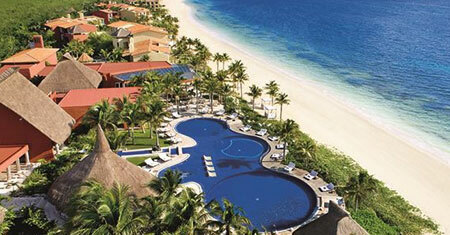 Offering 96 ultra-luxurious suites situated throughout an intimate ocean-front setting. Complimentary experiences including a 45-minute horseback ride on the beach and spa hydrotherapy access. With Endless Privileges® guests will enjoy access to personalized, private yacht transfer between the marina and the Zoëtry Villa Rolandi Isla Mujeres Cancun resort^, unlimited worldwide calls and concierge service, daily breakfast, lunch, and gourmet dinner options with an assortment of organic food and beverage selections, and 24-hour room service. Packages at these featured hotels include food and beverage, entertainment, activities, Endless Privileges® inclusions, and more. *Hotel savings vary depending on date of travel. **Resort coupons are issued per room, per stay. Resort coupons are issued for limited discounts on select amenities including spa treatments, a romantic dining experience, and wine purchases. Resort coupons cannot be applied toward beauty salon services, spa product purchases, telephone charges, dolphin experiences, gift shop purchases, boutique purchases, internet service (where applicable), marina services, dive shop, medical services, car rentals, or travel agency services. ^If adding airport to/from marina transfers to your vacation, the complimentary marina to/from hotel portion will be automatically confirmed for you. Review your travel documents for further instructions. If only needing the complimentary marina to/from hotel yacht transfer, contact hotel for times and details.